Contemporary, figurative, surrealistic oil on canvas painting by the Danish painter Bente Ørum, 2018. Portrait of an old satisfied man About the artist: Bente Ørum's paintings are figurative, often with a hint of surrealism. The paintings deal with people, their feelings and the challenges they have, the problems they meet. It is important for Bente Ørum that the painting causes the viewer to wonder what is really going on? The painting tells a story, but is not unambiguous. Different viewers will read different stories into the painting and there is no one story that is correct. Bente Ørum has painted since 2005 and has exhibited at different places, in 2018 at Porsebakken and Art-Nordic in Copenhagen. 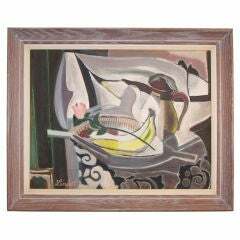 5-2589 Acrylic on canvas displayed in a linen mat and a black wood frame, signed lower right by Jones. 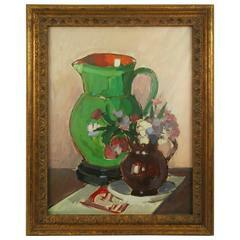 Image size 14 H X 17 W.
Oil on canvas in original frame. 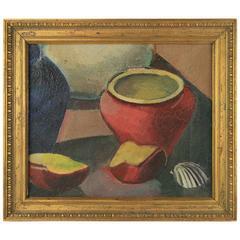 Listed Bay Area California artist Frank Lenfest b.1909-d.1968. “She Is Gone” 2010 oil\acrylic\canvas. When the woman leaves the room becomes quiet. There is a smell of perfume and silence. 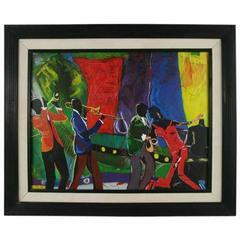 5-2521, gouache on paper displayed in a vintage giltwood frame under acrylic panel. 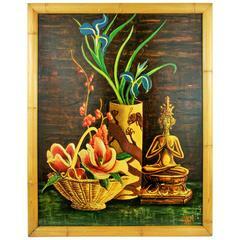 Image11x15"
5-2581 oriental stillife set in a faux wood frame, image size 14.5&quot; x 19.5&quot;. Signed Joseph Corey 1966. Painted on board.